The domestic cat (Felis catus) is descended from the African wildcat (Felis sylvestris lybica), and remains extremely closely related and very similar to this species in size, shape, behaviour and physiology. Like all cats, the domestic cat is a carnivore (primarily a meat eater) and is adapted to a hunting lifestyle. In fact, cats are extremely well adapted predators and they not only eat meat, but in fact they have become dependent on a meat diet (they are obligate carnivores) and actually cannot thrive or survive without meat in their diet. This is a simple and understandable adaptation for a hunting animal like the cat – there is no need for them to have special enzymes or metabolic pathways to digest and convert nutrients in plants to what they need, when it is present already in the animals they prey on! However, this adaptation to become strict carnivores means that cats have a number of special dietary requirements that do not apply to many other animals (humans and dogs for example), and it means that feeding a proper balanced diet to a cat can be much more challenging. The factors that influence palatability of food for cats are complex, but include texture, odour, taste, and temperature. The smell, or odour, of food is particularly important and cats have an extremely well developed sense of smell. This is also enhanced when food is slightly warmed, so cats actually prefer food that is around body temperature (around 35°C). The senses of taste and smell combine to give the perception of the flavour of a food, and for cats foods that have a high level of protein and fat in general are much more palatable. While cats can taste substances that are salty, sour or bitter, unlike humans and dogs they are not able to perceive sweet tastes. Again, this is a simple adaptation of an animal that is dependent on meat rather then plants for its survival. The texture of food is also important and in general cats prefer the texture of meat. Although we know what type of foods cats generally find most palatable, there is considerable variation between individuals. Some of this is simply as a result of food experiences early in life – kittens will tend to eat and like the same foods that they see their mother eating and may develop a strong preference for this. 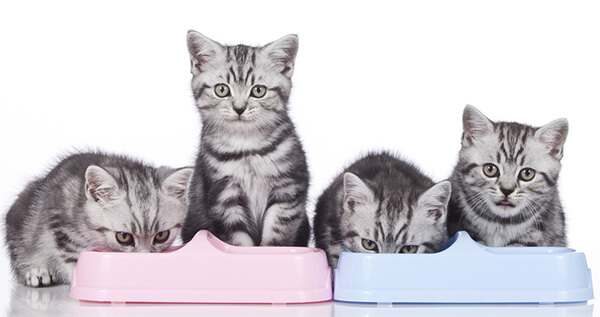 Additionally, some cats will develop a strong preference for a particular type of food (eg, wet/tinned food or dry food) when fed over a prolonged period of time. Nevertheless, most cats are inherently ‘neophilic’, meaning that they like to explore and try new and different foods and enjoy variety. At Vale Vets we sell Hills. It’s a very well balanced food offering your kittens every dietary requirement through every stage of his or her life. Under natural circumstances cats hunt and consume their prey throughout the day, consuming frequent small meals. Domestic cats will also tend to eat this way given the choice – rather than eating one or two ‘main meals’ each day they prefer to have many small meals. Other factors will also affect the feeding pattern of cats though, including what they become used to, lighting and noise levels, presence of other cats etc. Cats prefer to eat from shallow bowls so that they can see around them at the same time as eating and so their whiskers are not brushing against the sides of the bowl. Also, it is better to feed cats from a glass or ceramic bowl rather than a plastic bowl as plastic bowls can pick up odours (which may be unpleasant and become tainted). Stress can have a profound effect on feeding – cats will be much less likely to eat when stressed and will be much less willing to try any new or different foods. This can be of significance, for example, when a cat is hospitalised in a veterinary clinic – this is inevitably associated with some stress and offering the cat’s normal food rather than something new or different is likely to be more successful. Most cats have an inherent ability to control their energy intake well and avoid becoming overweight or obese. However, the self-regulatory mechanism is often interfered with in pet cats in a number of ways. Feeding very highly palatable foods may lead to excessive food intake, and having a ready supply of food provided for a pet cat means that they have to expend very little energy in acquiring their food (unlike the situation in the wild!). Additionally, most pet cats are neutered, and while this has many health and welfare benefits for the cat it does interfere with their natural ability to regulate calorie intake and they will tend to consume more than is required. For these reasons, it is important to try to control your cat’s food intake and avoid them becoming overweight. As in humans, all cats are individuals and have differing requirements to maintain their normal weight. Follow the instruction on the food packet/sachet/tin as an initial starting point, but adjust the daily amount up or down as necessary to keep your cat in peak condition. If using a dry food, ideally weight the food each day rather than using a measuring cup – this is a much more accurate way of making sure you are feeding the right amount. It will help to divide your cats food into several small meals and, especially is using dry food, these can be hidden in different places around the house, or you can use ‘feeding puzzles’ to provide your cat with some interest and fun in tracking down and finding their food.